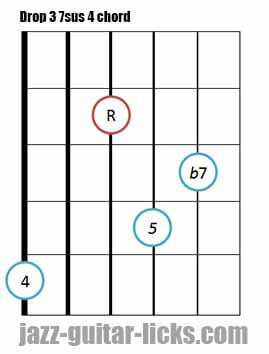 What's a dominant 7sus4 chord ? 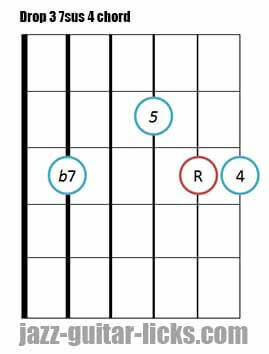 A Dominant 7th suspended chord, also known as "dominant seventh augmented fifth" chord or "dominant seventh sharp five chord," is a dominant 7th chord whose third is replaced by the perfect fourth. 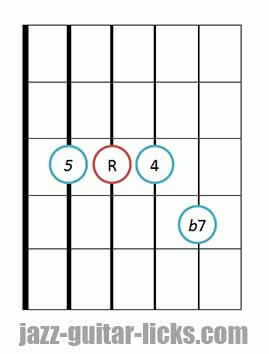 The absence of the third deletes the tritone between the 3rd and the b7. 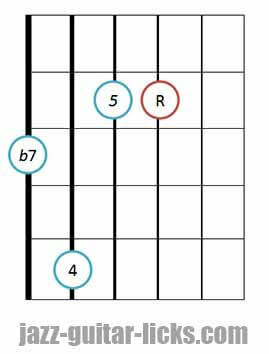 Dominant 7sus4 chords are neither minor nor major they are intermediaries between major 7th and minor 7th chords. 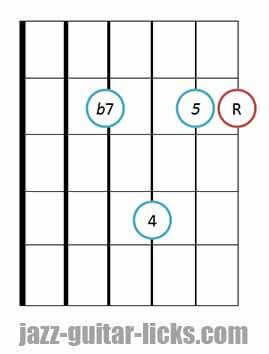 This gives a very open sound. 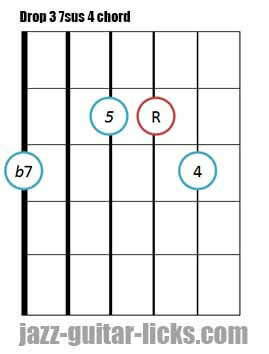 What's the difference between a dominant 7th and a dominant 7sus4 chord ? 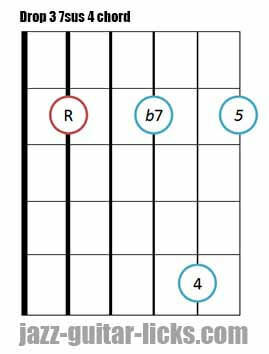 The main difference lays in the chord tones. 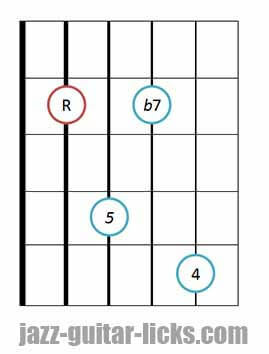 Dominant 7th chord tones are : root (1), major third (3), perfect fifth (5) and minor seventh (b7), whereas the chord tones of a 7sus4 are : root (1), perfect fourth (4), perfect fifth (5) and minor seventh (b7). 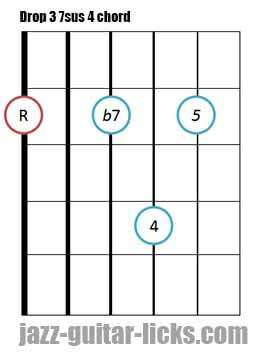 Why use the 4th instead of the third ? The fourth creates a suspension , a sound in which listeners are expecting to hear a resolution to the 3rd degree (the 3rd is suspended). 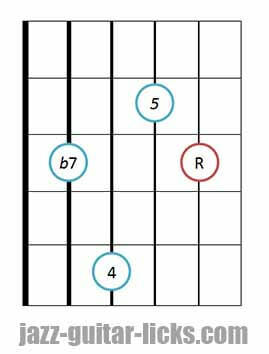 A 7sus4 chord can resolve to the third of a dominant 7th chord but, it can also not resolve. 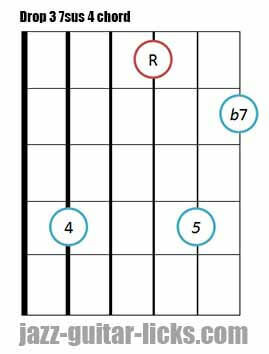 Here are twelve 7sus4 guitar chord diagrams based on drop 2 voicings. 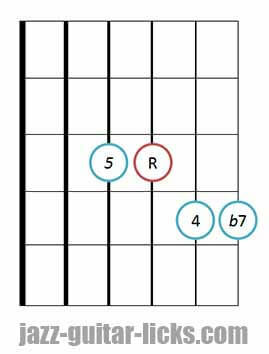 The first line provides drop 2 chords built from the E-string. 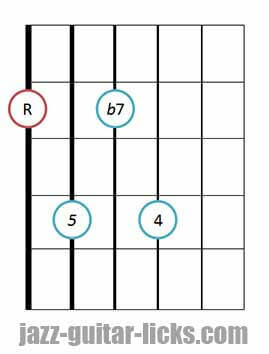 The second line includes drop 2 chords build from the A-string. 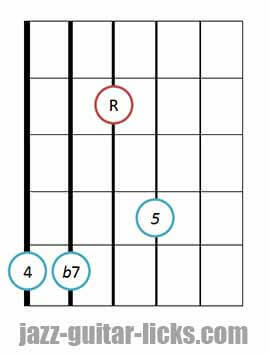 The third line shows drop 2 chords built from the D-string. 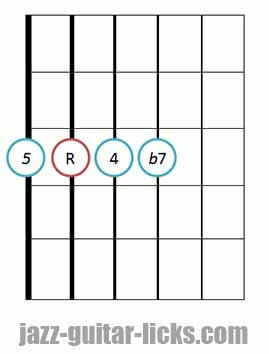 What are drop 3 chords ? 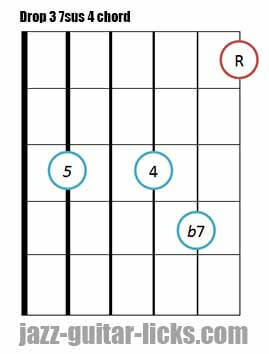 Drop 3 chords have a particular way of stacking the notes in the chord. 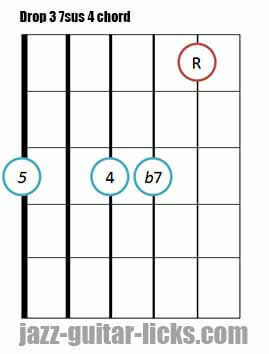 Like drop 2 chords they are very useful devices in music arrangement. 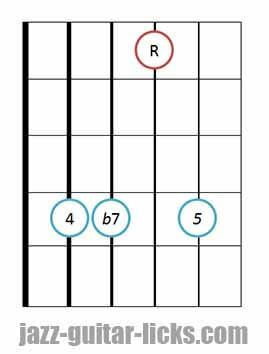 Drop 3 means to drop the third top note of a chord down an octave. 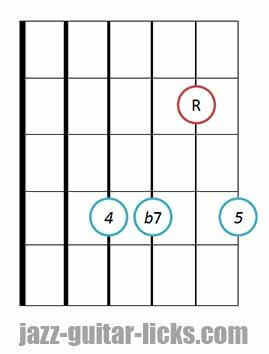 If your initial voicing is C-E-G-B (Cmaj7 chprd) the E will be dropped, then the drop 3 voicing will be E-C-G-B (Cmaj7 third in the bass). 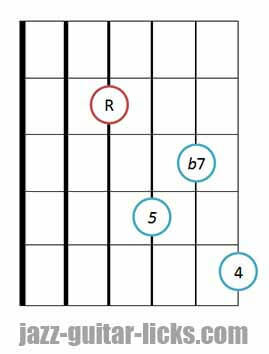 Here are the dominant 7sus4 voicings and their respective guitar shapes.